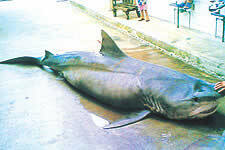 Shark measured 14 feet long and weighed 500kg. JERUDONG, Brunei -- It was the catch of the day for two Indonesian fishermen, Muji and Kastan, when they hauled back a 500-kilogramme pregnant Tiger Shark to Jerudong shore from Champion 7. The large and ferocious warm-water shark with stripped body measured at 14 feet in length and over nine feet in diameter. It was pregnant with more than 40 young sharks. The fishermen found the shark caught in their net around 9am yesterday and it took the two three hours to haul the shark back to shore. 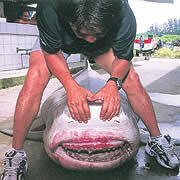 At the Jerudong fish market, the fishermen cut open the shark sold its fins at $50 per kg. They collected $500 for all 10kg of the fins. The Tiger Shark is a species most feared by humans. It is second only to the Great White and reaches a maximum length of 18 feet and is found in temperate and tropical seas. Considered as one of the few true scavengers, it is powerful and extremely ferocious.